If you are currently looking for a stylish and powerful new mid-size sedan that gives you the latest in automotive tech features and a host of active and passive safety features, all at a fair price, then head over to Santa Barbara Nissan today to see the the Nissan Maxima. You will soon discover that this mid-size sedan is worthy of a top spot on your list of cars to test drive! This gorgeous sedan is more stunning than ever after its redesign last year. But it's not just about the car's looks! Inside you will discover tech features that will delight any techie as well as comfort features that make driving this sedan a pleasure. If all of that sounds good to you, we invite you to come to Santa Barbara Nissan today to see the 2017 Nissan Maxima and all that is has to offer you. Our Nissan dealership serves Santa Ynez, Goleta, Isla Vista, Oxnard, Santa Maria, and Carpinteria, CA. If the 2017 Maxima has captured your attention, make sure you come to our Santa Barbara Nissan dealership today to take a test drive, or shop for your new Maxima on our website now. If you have been doing any research, you know that the mid-size sedan class is packed with competition. So let's find out how the 2017 Nissan Maxima compares to its worthy opponent, the Honda Accord EX-L V6. Both the 2017 Maxima and the Accord come with plenty of interior features like dual zone front air conditioning, power door locks and windows, remote keyless entry, and more. But if you go with the Honda, there are a few things you will miss out on. The Maxima has voice-activated audio control so you can stay focused on the road ahead, a handy feature that's not available on the Honda. The Nissan Maxima also has eight standard speakers, compared to the Accord's seven. Creature comforts are important, too. That's why the Nissan Maxima gives you a manual driver's seat cushion extension, another benefit you won't see inside the 2017 Accord EX-L V6. Other features you won't find offered on the Honda Accord EX-L V6, but that come with the 2017 Nissan Maxima include front and rear parking sensors that help you avoid getting too close to objects in front of, or behind you Nissan Maxima. There is also distance pacing cruise control, an illuminated glove box, rear reading lights, and an integrated navigation system with voice activation for the 2017 Nissan Maxima. The Honda Accord EX-L V6 comes with two standard door curb/courtesy lights while the Maxima has four. There is also a standard auxiliary audio input on the Maxima that you won't find provided on the Accord EX-L V6. When it comes to interior features, the 2017 Nissan Maxima outdoes the 2017 Honda Accord EX-L V6. All Nissan Maximas include many advanced features like NissanConnect to help you stay connected on the road. Equipped with a navigation system and a large, 8-inch color touchscreen display, you have access to all of your phone's features and apps with just a quick touch. 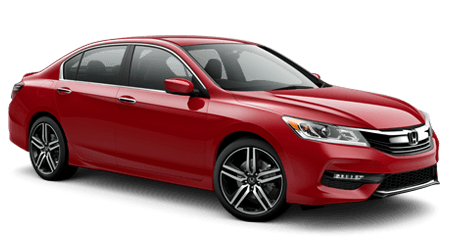 Sure, you can get a navigation system for the 2017 Honda Accord EX-L V6, but it will cost you; it's not offered as standard equipment. And you will definitely miss the big 8-inch screen the Nissan Maxima has. When it comes to front legroom and headroom, the 2017 Maxima wins again! Inside the Maxima, the driver and front passenger have 45-inches of legroom as well as 39.4-inches of headroom. The Honda Accord gives you 42.5-inches of legroom up front and 37.6-inches of front headroom. So the Maxima edges out the Honda Accord EX-L V6 yet again! When comparing the powertrain and performance of the 2017 Nissan Maxima to the 2017 Honda Accord EX-L V6, there are some similarities. Both cars come outfitted with a 3.5-liter V6 engine as standard equipment. But as you might suspect, there's more to the story. Which engine gives you more horsepower? The Nissan Maxima offers much more hp than the Honda, with the Maxima generating a nice 300 horsepower and 261 lb-ft. of torque, compared to the new Accord's 278 horsepower paired up with 252 ft-lb. of torque. 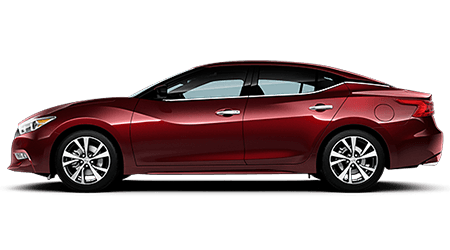 While it might be fun to drive the new Accord, if you are looking for thrilling performance, the Nissan Maxima will take you there faster! The new Maxima rolls on 18-inch wheels, while the Honda Accord is equipped with 17-inch wheels. The new Maxima has an 18-gallon fuel tank, a little better than the Accord's 17-gallon gas tank. The Nissan's transmission provides standard sequential shift control, something you can't get on the Accord EX-L V6. So when it comes to performance and power, the Maxima is the obvious choice! Keeping you and your family safe on the road is a primary concern, both for you and for Nissan. The automaker wants to ensure that their customers stay out of harm's way. That is why they equipped the Nissan Maxima with ample safety features, both active and passive. Although both the Honda and the Nissan offer significant safety technologies and equipment, there is a notable difference. The Maxima comes with Intelligent Brake Assist, a technology that uses radar to determine if a collision can or cannot be avoided. Once the IBA detects that an accident is imminent, it automatically operates the brake to minimize damage and injuries. If you are looking at buying the Maxima or the Accord EX-L V6, you should know that, between these two vehicles, you can only get Intelligent Brake Assist on the Maxima. At Santa Barbara Nissan, we are proud to serve drivers near Santa Ynez, Goleta, Isla Vista, Oxnard, Santa Maria, Carpinteria, and, of course, Santa Barbara, CA. So if you are looking for a powerful, sophisticated sedan that's large enough for five passengers, you have got to come down and take a look at the 2017 Nissan Maxima. We have the new Maxima in stock right now in all kinds of colors and trim levels. Let one of our friendly sales associates take you out for a test drive today so that you can experience this powerful car's smooth ride for yourself. You can slip behind the wheel and see how all of the amazing tech and comfort features help to make this mid-size 4-door sedan stand out from the competition. And after you buy your new Nissan Maxima, remember to bring it to our service center for vehicle maintenance and repairs. It's the best way to keep your Nissan in top running condition for as long as possible. Our dealership is located at 425 S. Kellogg Ave., Santa Barbara, CA 93117. We invite you to come to our friendly car dealership today, or you can also browse our entire inventory of new Nissan vehicles for sale in Santa Barbara, including the amazing 2017 Nissan Maxima, right here on the Santa Barbara Nissan website.